It is not uncommon to come across striking duos that surface in the music scene, but it is rare that its members are recognized as brother-sister duos that actually work. 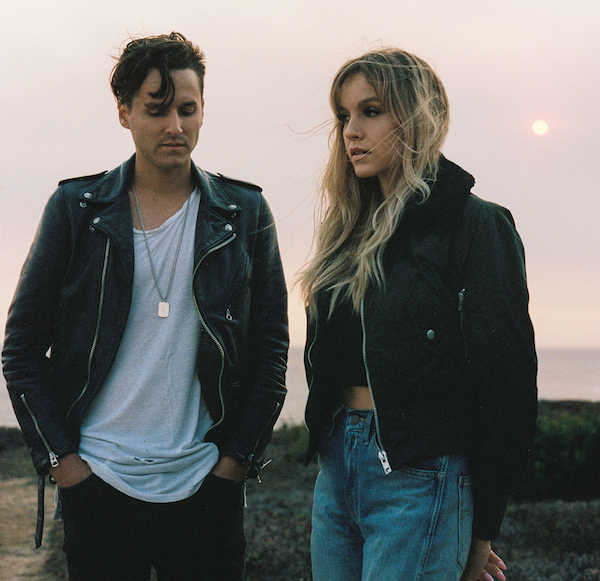 XYLØ has become the archetype for the exemplary fashion in which being siblings can benefit your music, and it is showcased through the product of what they create. As siblings, Paige and Chase Duddy utilize their connection and generate some of the most uniform sounds that Los Angeles itself has contributed to the world of music. From what began as the band releasing songs solely on SoundCloud to them embarking on tours across the country, one can conclude that their rapid growth is due to not only overwhelming support from friends and fans, but also undying dedication and hard work. Having recently concluded their tour with The Naked and Famous, signed a major label deal with Disruptor Records/Sony RAL, and released the electric single “Setting Fires” with The Chainsmokers, XYLØ seem perfectly positioned for an exciting and fruitful 2017. Their latest release, the electro-pop burner “Get Closer,” mixes intimacy and darkness with a critique on modern communication. In advance of what is sure to be an exciting year for the promising duo, Atwood Magazine spoke with both Paige and Chase to get to know the heads behind the dynamic band we all cannot get enough of. Atwood Magazine: At what moment did you guys decide that it was time to begin the eccentric duo we all know as XYLØ? Chase: That was back in 2014 when we worked on a project together for an advert I was doing. I asked Paige if she wanted to come over and help with it, and it kind of just clicked. We had a lot of fun doing it, and we wanted to create music that was true to what we were into, so yeah – that was kind of what drove us forward into writing more and forming an actual band. How has being siblings both helped and hurt your music? Paige: It helps because we have really good chemistry and we like a lot of the same things, have similar tastes, and similar interests when it comes to fashion and music. Then again we are siblings, brother and sister, 10 years apart, so there is hormonal involvement when it comes to disagreements but we work it out. Chase: Yeah, being siblings and being brought up by the same parents where we hear the same music created a pretty easy environment for Paige and I to get along with things artistically. Obviously being a male and a female and being 10 years apart, we are in different parts in our lives, so that can be a challenge for us both. Being brother and sister you kind of push certain buttons that you would not necessarily do with someone else, but also on the flip side of that since we are brother and sister we know that we will make up and everything will be cool. As individuals, what would you say that you both contribute to XYLØ? Paige: Aside from singing and performing, there is a creative side to XYLØ so I feel like Chase and I both work creatively with the aesthetic for music videos and merchandise. I also run our social media. Chase: I produce our music, and there is a studio at my home so that is kind of our home-base for our music. Day to day, I handle a lot more of the administrative and business side of things, in addition to the creative details that Paige and I collaborate on. Paige: He also provides the Heineken. Who are some of the people that you would say shape the sound that you have coined, and in what ways have they contributed it? Chase: I would say (not to speak for Paige) our grandfather is probably the biggest musical influence in our lives. He is a professional percussionist, jazz drummer, and educator as well at some of the music schools in LA. If it wasn’t for him, we probably wouldn’t be doing this. He’s like the family patriarch. He’s still around and he’s still playing to this day at 85 years old. Shout out Pops! Paige: I also believe where we come from has a lot to do with the sound of our music and what we talk about, and the reason our music is darker and moodier. We don’t come from a dark town, but just the way we were brought up and the way our family left our sense of humor be (coming from a suburban town), it influenced a lot of our music. How would you describe your growth since the America EP? Chase: I think Paige’s voice has definitely grown and expanded a lot. I was reflecting on this yesterday actually, and Paige and I have gotten a lot faster working together in the way that we’re able to finish songs faster. Our sound is a little more polished because I personally got better as a producer and an engineer, so things are a lot more defined and recorded better than the EP. Paige: As a band, the more you continue to do something, the better you will get. The new music we’re making now is the same music we were making before, but it’s just to a different caliber since we’ve been getting better. Now you recently just finished touring with The Naked and Famous, what was that experience like for you? Paige: It was really fun because we were on tour for 40 days with them, and we made a lot of friends that we still currently talk to. We learned a lot as a band, grew as a band, and by the end of it I think you could tell we had been touring so long because of how comfortable we all were as musicians and performing on stage. It was a really great experience. What does the coming year hold for you guys as a band? Chase: Getting a lot of music out because we’ve been working a lot this year on the songs, so hopefully we’ll be releasing songs more consistently, and getting an album out at some point in 2017. There’s also touring and festivals we’ve been getting offers for, like Air+Style that we’ll be playing in February. We’re really looking to bring XYLØ to a new level with our merchandise, our art, visuals, and everything else. I'm a Los Angeles native currently attending the University of California, Santa Barbara as a psychology major. Music runs through my veins and write about it because it helps me understand it better.